Bucks guard Eric Bledsoe is fouled by Hawks guard Jeremy Lin during the first half Sunday in Atlanta. Bledsoe was 9-for-13 from the field and 4-for-4 from the line. Bucks forward D.J. Wilson pulls down a rebound against Hawks forward John Collins in the second half. Wilson had eight points, four rebounds and two blocks in 17 minutes off the bench. 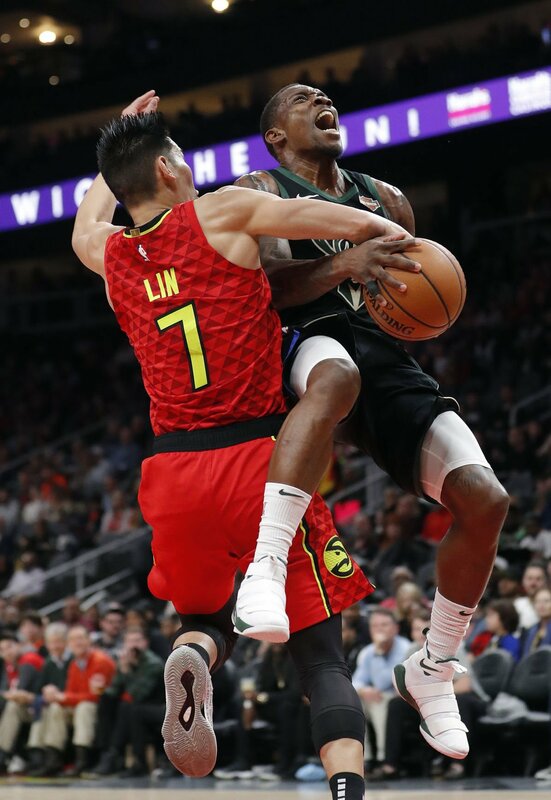 Antetokounmpo scored 33 points, Eric Bledsoe had 24 points and 10 assists and Milwaukee beat the Hawks 133-114 on Sunday in Mike Budenholzer’s return to Atlanta. The Bucks are soaring, thanks mostly to the 6-foot-11, 242-pound Antetokounmpo, who scored 14 on free throws and had two dazzling assists early in the fourth. He first smothered Young to steal the ball and feed George Hill for a 3-pointer that made it 104-90, before adding a no-look drop pass on D.J. Wilson’s layup for a 16-point lead. He later hit a couple of jumpers to make it a 15-point advantage. Milwaukee has won 12 of 15 dating to Dec. 14, including a 144-112 victory over Atlanta on Jan. 4 at Fiserv Forum. The Bucks began the day outscoring opponents by an NBA-leading 9.1 points per game. Young finished with 26 points and DeAndre’ Bembry had 18 for Atlanta, which saw its record fall to 13-30. The Hawks have dropped six of eight. Their 24 turnovers led to 36 points for Milwaukee. Antetokounmpo did a postgame jersey exchange with 41-year-old Hawks forward Vince Carter. “I’m a big fan of his,” Antetokounmpo said. “He’s done great things for this league.” ... Bucks guard Malcolm Brogdon scored 14 points and missed just his second free throw in 86 free throw attempts this season. ... Middleton began the day averaging 20.4 points over his previous eight games. ... Hawks forward Taurean Prince, the team’s third-leading scorer, returned after missing the past 18 games with a left ankle sprain. On a minutes restriction, Prince had seven points and five rebounds in 11 minutes. ... Hawks guard Kent Bazemore, the team’s second-leading scorer, has missed eight straight games with a right ankle injury. ... The Bucks requested waivers on two-way guard Jaylen Morris, who appeared in four games with the Bucks this season and averaged 2.5 points, 1.3 rebounds and 1.0 assist. ... Milwaukee next hosts Miami on Tuesday. MILWAUKEE — Middleton 8-19 1-2 17, Antetokounmpo 9-17 14-19 33, Lopez 4-6 0-0 9, Bledsoe 9-13 4-4 24, Brogdon 5-13 3-4 14, Ilyasova 2-5 0-0 5, Smith 0-1 2-2 2, Wilson 3-3 0-2 8, Hill 5-7 0-0 11, Brown 2-4 0-0 5, Snell 2-4 0-0 5, Connaughton 0-0 0-0 0. Totals 49-92 24-33 133. ATLANTA — Bembry 7-15 2-2 18, Collins 6-17 1-1 13, Spellman 4-9 1-2 13, Young 7-16 11-13 26, Huerter 3-9 3-4 11, Prince 3-6 0-0 7, Len 5-8 2-2 12, Lin 2-10 3-4 7, Carter 1-4 0-0 3, Dorsey 0-1 0-0 0, Anderson 1-1 1-2 4. Totals 39-96 24-30 114. 3-point goals — M 11-30 (Wilson 2-2, Bledsoe 2-6, Snell 1-1, Brown 1-2, Ilyasova 1-2, Hill 1-3, Lopez 1-3, Antetokounmpo 1-3, Brogdon 1-5, Smith 0-1, Middleton 0-2), A 12-38 (Spellman 4-7, Huerter 2-5, Bembry 2-6, Prince 1-1, Anderson 1-1, Carter 1-4, Young 1-5, Dorsey 0-1, Collins 0-4, Lin 0-4). Fouled out — Len, Lopez. Rebounds — M 39 (Middleton 11), A 54 (Collins 11). Assists — M 28 (Bledsoe 10), A 19 (Lin 5). Total fouls — M 25, A 30. Technicals — Antetokounmpo, Lopez. Att. — 16,292. After serving as home to the Milwaukee Bucks for three decades, the Bradley Center moved one step closer to its demise when crews blasted the steel roof off the arena on Sunday morning.